The application of the ecosystem approach in MSP shall be achieved through adapting the essential features of the planning process, and through environmental as well as economic impact assessment(s). EBA practices are closely linked to the topic MSP Sectors, Indicators, monitoring and Evaluation, Land-sea interactions in MSP as well as Environmental Assessments. Few precise practices exist, which show how to apply the EBA within a specific ecosystem or region. Most notably the HELCOM-VASAB MSP WG has agreed in 2015 on a procedurally oriented Guideline for the implementation of an ecosystem-based approach in MSP in the Baltic Sea area. Latvia and Sweden have further elaborated practical EBA approaches to be used for MSP. In Germany, R&D projects are reviewing and revising scientific methods and investigate which ecosystem processes are essential for the implementation of the EBA. In other available practices, especially from the Black Sea region, the EBA approach described is not directly linked to MSP but to legal frameworks such as Natura 2000 or the MSFD or aims to foster the implementation of the ICZM. GIS applications for EBA and recommendations how to use the concept of “cumulative impacts” already provide guidance, also with respect to MSP. The aspects of cumulative effects evaluation and conflicts evaluation are covered with some tools, e.g. COEXIST Analysis of conflicts score and ADRIPLAN Conflicts Score Tool. The ecosystem-based approach (and similar terms ecosystem-based management, or ecosystem approach) is highlighted as an important underlying principle within maritime spatial planning. It has its origins in the UN Convention on Biological Diversity (CBD). The ecosystem-based approach (EBA) has had a large impact on policies concerning the usage and management of natural resources and is also a starting point for the EU's Marine Strategy Framework Directive. According to the EU MSP Directive, MSP shall follow the ecosystem-based approach, which means – among other requirements – that MSP shall be based on the best available scientific knowledge about the ecosystem and its dynamics (cf. HELCOM & OSPAR, 2003). In practice this transposition has a number of challenges. Practical implementation of the ecosystem-based approach as the scientific basis for MSP is in the early stages throughout the EU. Application of the ecosystem-based approach presupposes a holistic perspective, continual development of knowledge of the seas and their usage, application of the precautionary principle, and flexible management. 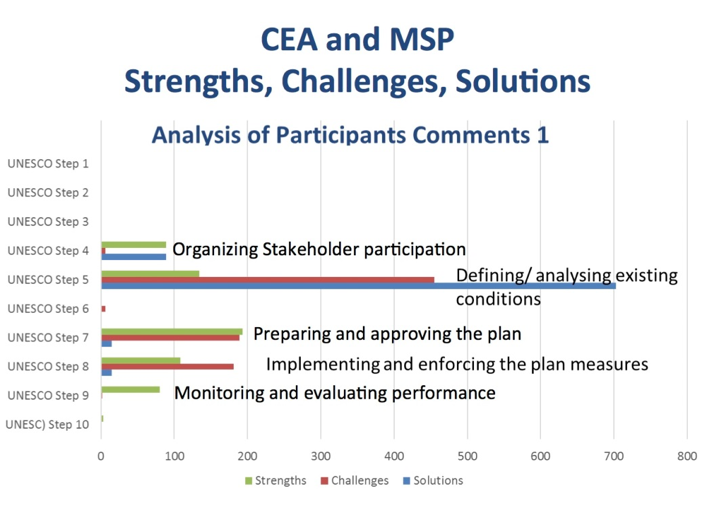 In all MSP contexts one of the main challenges, related to this topic, is the evaluation of cumulative effects that may result from the combination of different projects and activities and the potential lack of a continuous series of data and related assessment tool. This aspect is linked to the need for evaluation and monitoring of conflicts among uses, in order to detect how these conflicts evolve in the course of implementation of a MSP plan. The EU MSP Platform developed a policy brief on the topic of implementing EBA in MSP. The brief provides a detailed overview of EBA in relevant EU legislation, including the relationship between the Marine Strategy Framework Directive and the MSP Directive; discussion of the challenges and potential solutions for integrating EBA and MSP; and examples of existing tools for integrating the two. The policy brief can be downloaded here. The questions below provide more detailed information described in the policy brief. The definition of the ecosystem-based approach used in the HELCOM-VASAB Guideline, as adopted jointly by HELCOM-OSPAR in 2003: "the comprehensive integrated management of human activities based on the best available scientific knowledge about the ecosystem and its dynamics, in order to identify and take action on influences which are critical to the health of marine ecosystems, thereby achieving sustainable use of ecosystem goods and services and maintenance of ecosystem integrity." Are there application examples and guidance available that can help MSP authorities operationalize EBA? General support is provided by guidance or pilot plans. At the sea-basin level, the HELCOM Guidelines for the implementation of the EBA in MSP refer to the Baltic Sea context and elaborate on the key elements to consider when applying the approach, such as deploying best available knowledge and practice, following the precautionary principle and identifying ecosystem services. The practice includes also the analysis of the relevant legal and policy context for the ecosystem-based approach, such as the Helsinki Convention, HELCOM Baltic Sea Action Plan and the Joint HELCOM-VASAB MSP Principles. Additionally, in the Mediterranean Sea, a Roadmap for implementing the EBA as a guiding principle for the Mediterannean Action Plan Programme of Work was developed, under the auspices of UNEP/MAP Barcelona Convention. Individual countries have also developed guidance or frameworks for EBA in the context of their national MSP processes. In a practical guidance of the Marine Management Organisation, the CBD Principles for EBA have been modified for application in marine planning in England. Implementation of EBA in MSP in Latvia follows a three step approach: a) analysing best knowledge and practice and identification of ecosystem services, b) finding alternative developments to assess impacts on marine ecosystems and c) applying precaution and mitigation when using an impact matrix. The Guidelines developed for the project ECODUMP are explicitly dealing with the influence of MSP and ecosystem based principles on the search and assessment of new disposal sites at the near-shore of Lithuania. 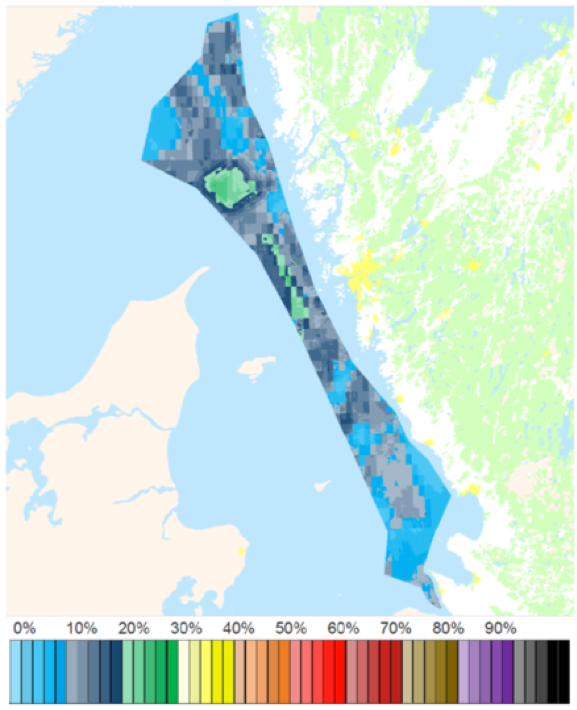 The pilot plan for the Western Gulf of Gdansk developed in the project BaltSeaPlan outlines the preparation of an SEA report for maritime spatial plans in line with the EBA and with the special issue that the planned area contains Natura 2000 sites. The ADRIPLAN methodology provides techniques and methods based on the EBA for practically implementing MSP in the Adriatic-Ionian macro-region. The project BALANCE outlines the concept of blue corridors and how to work with it during practical marine spatial planning processes. Different studies and tools are providing support when implementing ecosystem-based management. ECOMAGIS developed a complex GIS for an ecosystem-based management through integrated monitoring and assessment of the status of flora and fauna in the Romanian part of the Black Sea. Two practices have developed tools for all sea basins like the MareFrame Decision Support Framework and the ODEMM approach for EBA. Are there practices available to find out more about the application of cumulative impact methodologies? 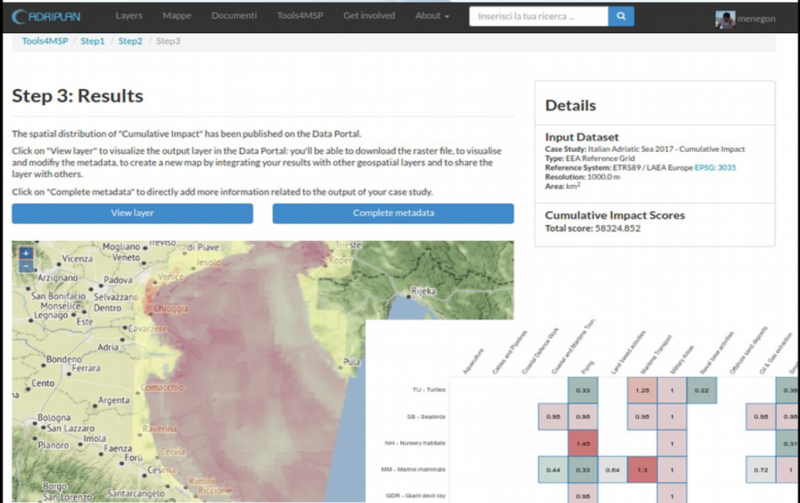 The ADRIPLAN Cumulative Impact Tool was developed to evaluate the potential cumulative impacts of various maritime activities on the marine environment in the Adriatic-Ionian macro-region. It was initially developed in the ADRIPLAN project, and then further advanced in the Ritmare project to incorporate methodological advancements related to human and environmental components, and quantification of pressures and sensitivities. The tool is integrated into the Tools4MSP Geoplatform (formerly ADRIPLAN Data Portal) and is used to support MSP exercises within other projects (e.g. SUPREME). The ESaTDOR and Med-IAMER projects investigated typologies of land-sea interactions and developed associated spatial indicators, which were then used in a cumulative impact assessment of environmental pressures. In national MSP processes, Sweden uses the Symphony method to compare the environmental impact of different plan alternatives and assess cumulative impacts. The tool is used in the Strategic Environmental Assessment of the Swedish MSP (under development) to assess ecological risks. Symphony is being further enhanced as part of the Pan Baltic Scope project. The SIMCelt project applied two cumulative effects assessment tools - ODEMM to offshore Brittany and Marlin to the Irish Sea – to investigate how to make cumulative effect assessments function for marine planning. Lessons learned include the importance of interpreting maps resulting from an assessment, the need to consider future developments, end user needs, and data availability. SIMCelt also studied at what points in the MSP process is cumulative effects assessment most useful, shown below. Further work is planned on cumulative effects assessment in several projects, such as the SIMNORAT / SIMWESTMED joint working group on a common methodology for cumulative impact assessment. The Pan Baltic Scope project will also work with HELCOM's Baltic Sea Impact Index to further integrate cumulative effects assessments and MSP. What kind of knowledge is available at the sea basin level regarding seabed habitats, which could be used for applying the EBA in MSP? There is one tool available for the specific region of the North-East Atlantic: from the MESHAtlantic project. It compiles the knowledge of our seas, particularly the seabed habitats, and produces harmonised habitat maps for the Atlantic Area. This includes conversion of existing paper-based maps to digital formats. Examples of mapping Natura 2000 sites are used to test mapping methods. How is the implementation of MSP linked to Good Environmental Status (GES) and the related objectives and measures of the Marine Strategy Framework Directive (MSFD)? EU Member States (MS) must ensure that no significant risks or impacts on marine biodiversity, marine ecosystems or human health are posed by legitimate uses of the sea. This is enshrined in the Marine Strategy Framework Directive (MSFD; 2008/56/EC), a piece of EU law, which extends monitoring and assessment of EU seas out to 200 nm. As such, the main aim of the MSFD is ‘to promote sustainable use of the seas and conserve marine ecosystems through the aim of achieving a Good Environmental Status(GES), based upon 11 Qualitative Descriptors by 2020’. In the MSFD cycle (Figure 1) to achieve GES by 2020, a first step is that MS produce initial assessments of the environmental status for their national parts of the seas. Next, monitoring programmes and programmes of measures (PoMs) are developed, including spatial protection measures. Image source: Borja, A., Elliott, M., Andersen, J. H., Berg, T., Carstensen, J., Halpern, B.S., Heiskanen, A-S., Korpinen, S., Stewart Lowndes, J.S., Martin, G., Rodriguez-Ezpeleta, N. (2016). Overview of Integrative Assessment of Marine Systems: The Ecosystem Approach in Practice. Frontiers in Marine Science, 3:20. https://www.frontiersin.org/article/10.3389/fmars.2016.00020. Doi. 10.3389/fmars.2016.00020. On the other hand, the Maritime Spatial Planning Directive (MSP Directive, 2014/89/EU) aims for ‘the sustainable growth of maritime and coastal economies and the sustainable use of marine and coastal resources’. Despite the fact that each of the Directives have their specific objectives, many authors- have shown the importance of linking these Directive´s efforts (along with others such as the Water Framework Directive (WFD, 2000/60/EC) or Habitats Directive (HD, 92/43/EEC)) in order to attain their objectives in a more coherent way (Figure 2). 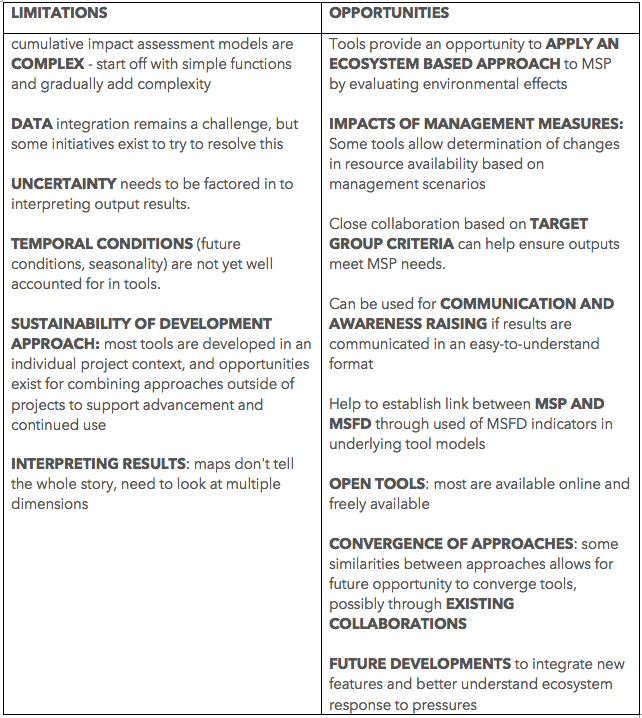 One possible way of linking both objectives of the MSFD and MSPD could be through the ecosystem-based approach, defined under Main Issues above and discussed in several sources. 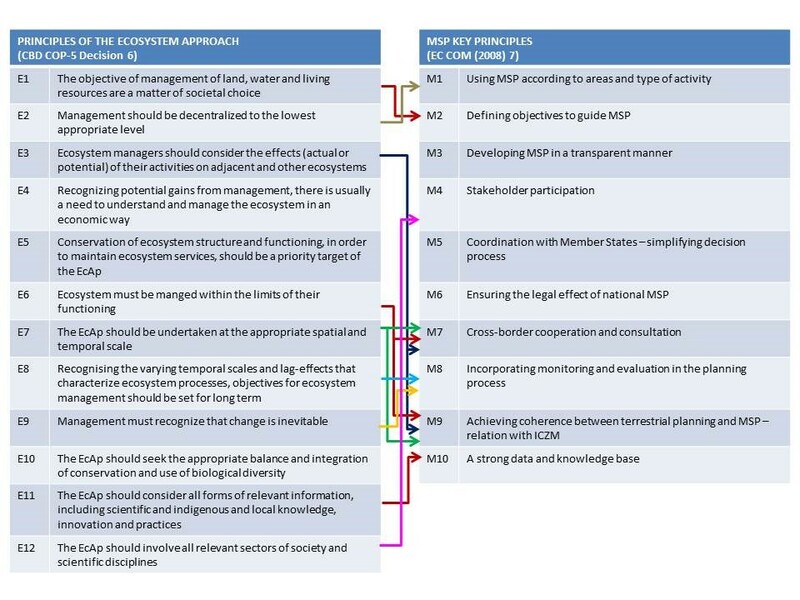 The MSP Directive sets out 10 key principles which are closely linked to the principles of the ecosystem-based-approach as defined under the Conference of Biological Diversity. These two groups of principles can be related as described in Figure 3. Practical ways on how to integrate ecosystem-based approach principles in the MSP process have been proposed, for example, by the experience in the Baltic Sea. As contemplated in the MSP Directive, this legislative instrument should apply the ecosystem-based approach, as referred to in Article 1(3) of the MSFD, with the aim to ensure that the collective pressure of all activities is kept within levels that are compatible with the achievement of GES. The preamble clearly emphasizes the fact that the monitoring of indicators of GES in the MSFD is a key factor when it comes to assessing the effectiveness of the programs and achieving the anticipated objectives on a regional and local scale. However, the application of the ecosystem-based approach still entails some difficulties as to merge environmental quality management (e.g. MSFD) with MSP and Blue Growth initiatives. The main challenge remains on how to maintain and protect ecological structure and functioning (MSFD) while at the same time allowing the system to produce sustainable ecosystem services from which we derive societal benefits (MSP Directive). 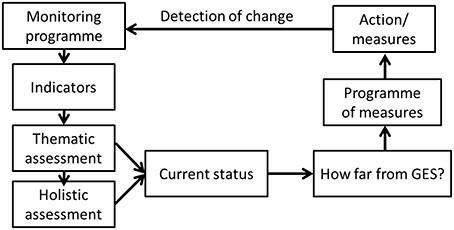 Furthermore, uncertainty still exists on cumulative and in-combination effects, footprints of activities and footprints of both Directives (spatial and temporal). Drivers beyond the remit of MSP but with pressures that might need explicit consideration when developing plans. regularly undertaking assessments and considering marine ecosystems in a holistic way (including humans as part of the system),,. Concept of GES accommodates the structure, function and processes of the marine ecosystems together with natural physiographic, geographic and climatic factors, as well as physical and chemical conditions including those resulting from human activities in the area concerned. Qualitative Descriptors (QD) are: Biodiversity; Alien species; Fishing; Food-webs; Eutrophication; Sea-floor integrity; Hydrography; Pollution in the environment; Pollution in seafood; Litter; and Noise/energy. Boyes, S. J., and Elliott, M. (2014). Marine legislation – The ultimate ‘horrendogram’: International law, European directives & national implementation. Mar. Pollut. Bull. 86, 39–47. doi: 10.1016/j.marpolbul.2014.06.055. Maccarrone, V. Filiciotto, F., de Vincenzi, G., Mazzola, S., Buscaino, G. (2015). An Italian proposal on the monitoring of underwater noise: Relationship between the EU Marine Strategy Framework Directive (MSFD) and marine spatial planning directive (MSP). Ocean & Coastal Management 118, 215-224. doi: 10.1016/j.ocecoaman.2015.07.006. Borja, Á., M. Elliott, J. Carstensen, A.-S. Heiskanen, W. van de Bund, 2010. Marine management - Towards an integrated implementation of the European Marine Strategy Framework and the Water Framework Directives. Marine Pollution Bulletin, 60: 2175-2186. CBD COP 5 Decision V/6 2003. Ecosystem approach. Ramieri E., E. Andreoli, A. fanelli, G. Artico, R. Bertaggia 2014. Methodological handbook on Maritime Spatial Planning in the Adriatic Sea. Final report of SHAPE project WP4 “Shipping towards maritime spatial planning”. HELCOM-VASAB 2016. Guideline for the implementation of ecosystem-based approach in Maritime Spatial Planning (MSP) in the Baltic Sea area. Borja, A., M. Elliott, J. H. Andersen, A. C. Cardoso, J. Carstensen, J. G. Ferreira, A.-S. Heiskanen, J. C. Marqués, J. M. Neto, H. Teixeira, L. Uusitalo, M. C. Uyarra, N. Zampoukas, 2013. Good Environmental Status of marine ecosystems: What is it and how do we know when we have attained it? Marine Pollution Bulletin, 76: 16-27. Cinnirella, S., Sardá, R., de Vivero, J.L.S., Brennan, R., Barausse, A., Icely, J., Luisetti, T., March, D., Murciano, C., Newton, A., et al., 2014. Steps toward a shared governance response for achieving Good Environmental Status in the Mediterranean Sea. Ecol. Soc. 19, 47. According to the indications provided in the Commission Decision 2017/848/EU of 17 May 2017 laying down criteria and methodological standards on good environmental status of marine waters and specifications and standardised methods for monitoring and assessment, and repealing Decision 2010/477/EU. Brennan, J., C. Fitzsimmons, T. Gray, L. Raggatt, 2014. 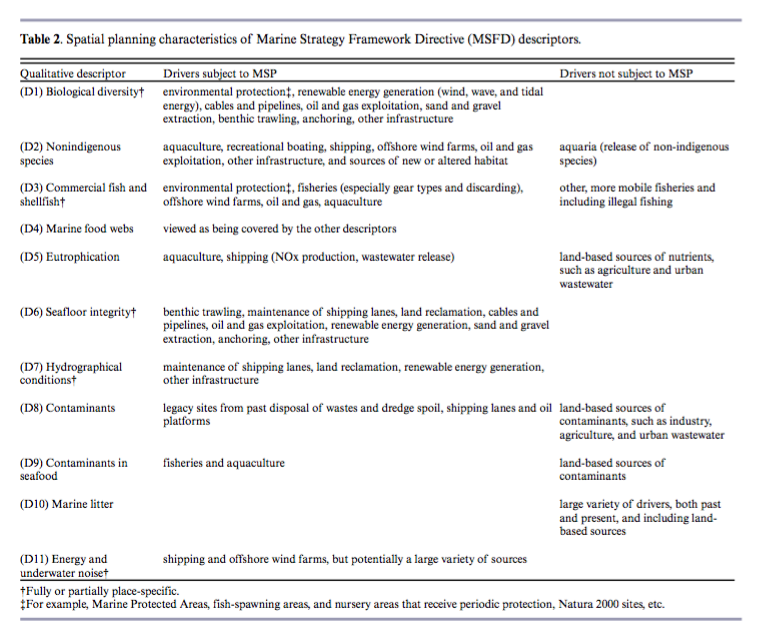 EU marine strategy framework directive (MSFD) and marine spatial planning (MSP): Which is the more dominant and practicable contributor to maritime policy in the UK? Marine Policy, 43: 359-366. Gilbert, A. J., K. Alexander, R. Sardá, R. Brazinskaite, C. Fischer, K. Gee, M. Jessopp, P. Kershaw, H. J. Los, D. March Morla, C. O'Mahony, M. Pihlajamäki, S. Rees, R. Varjopuro, 2015. Marine spatial planning and Good Environmental Status: a perspective on spatial and temporal dimensions. Ecology and Society, 20. The PISCES guide was developed by multi-ntaional, multi-stakeholder collaboration and explores what is needed to implement the ecosystem approach in the context of the Marine Strategy Framework Directive. The Guide provides recommendations to stakeholders and government on all steps of MSFD implementation and principles for applying the ecosystem approach. The Cumulative Impact is the main methodological tool used in ADRIPLAN to evaluate the potential impact of maritime activities on the environment, quantifying the pressures generated by the uses on the environmental components (in the current and future scenarios). Cumulative impacts are a key point for the construction of maritime spatial plans using an Ecosystem Based Approach (EBA). The analysis of cumulative impacts aims at identifying areas in the sea where the environmental and ecological components are more exposed to anthropogenic pressures that negatively affect them. Methodology developed to carry out the ADRIPLAN project and proposed as reference methodology for practically implementing MSP in the Adriatic and Ionian Region (including Bosnia and Herzegovina, Montenegro and Albania). ODEMM developed an approach including a series of resources that can help support decision-makers to implement operational EBM. This report documents the overall approach and individual resources developed, before reflecting on how the work completed emulates what decision-makers might need to implement EBM. Developing, testing and adapting a decision support framework (DSF) to provide an evidence basis for policy makers and other stakeholders about the trade-off between various management options on a multispecies basis. DISPLACE allows contributing to marine spatial planning for evaluating the effects on stocks and fisheries and ultimately incorporating other utilization of the sea such as energy production, transport, recreational use, etc. The Symphony method provides valuable analyses for MSP in any context and informs planners of the baseline conditions and the potential effect of various planning options on the cumulative impacts in different areas. This report presents a first attempt to map human activities, pressures and potential cumulative impacts in the eastern parts of the North Sea. The mapping is based on existing data on human activities in Denmark, Germany, Norway and Sweden. The authors developed and tested an approach to identifying priority areas for conservation that are less impacted by human activities than other areas. The approach combined Marxan and cumulative impact decision support tools to analyse areas for conservation initiatives in marine waters off of mainland Portugal.